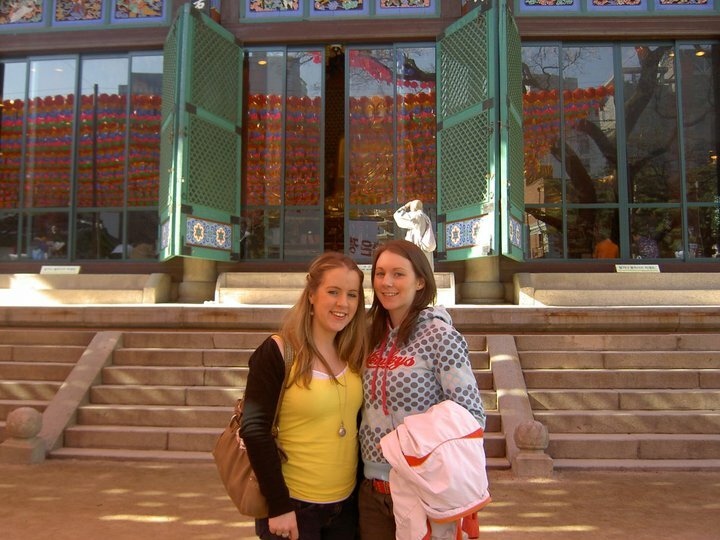 Craic in Korea: Joanne's Korean adventure. Joanne and I celebrating my birthday! I have fallen way behind on my blog lately but with good reason because I had the most fantastic week with my little sister! The days before Joanne arrived I felt like a little kid waiting for Santa at Christmas. I could hardly sleep with excitement. That Thursday in work I couldn't concentrate even a little, constantly wondering where exactly she was at that time. When my head-teacher rang to say that Joanne was in reception I galloped down the stairs. Hugging Joanne was the best feeling, I had missed her so much. Seeing her there in my classroom was so surreal. I brought her home to get some sleep and reluctantly went back to teach. That night we went to a friend's and enjoyed delicious home-made pizza. Next morning I got up and went to work while Jo still slept, I expected her to stay sleeping... what I didn't expect was to find her still sleeping when I returned from work that afternoon. We took it easy that night playing the nintendo wii with Kyle and Vanessa. Bed early because we were getting up at 4.30 to catch the 5.08am train to Busan. 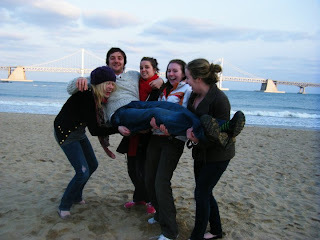 We arrived in Busan at 9.30 that morning and headed straight for the motel. Poor Jo was wrecked as she hadn't slept at all and so after a quick look around we we back for a power nap. 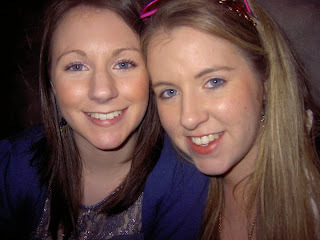 That night however with our energy slightly restored we got ready and Joanne's true Korean adventure began. 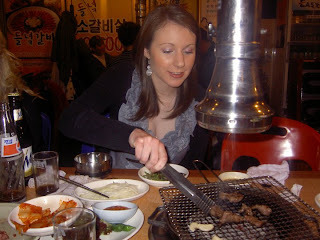 After Joanne's failed attempt at using chopsticks she opted to try her hand at cooking. First thing on the list was a traditional Korean bbq dinner. Sam lead us down side-alleys and winding streets until we arrived at the restaurant which although it looked run-down he assured us he had tasted the best food in Korea here. Joanne's first trial came with the use of chopsticks and I'm afraid to say she failed miserably!! Not only did she manage to not secure and thus drop the food she had between her chopsticks but she also managed to knock over her drink in the process. (All that she managed in the first attempt). After that she gave up even attempting and resigned to eating her food with her fingers and a soup spoon. 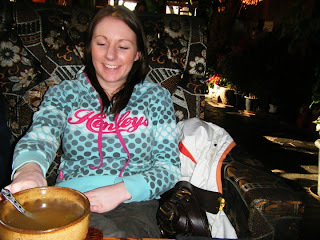 After that we went for fruit soju (basically a fresh fruit smoothie with alcohol...yum!!). After the fruit soju we decided that it was time to enjoy a visit to the casino (unfortunately no cameras are allowed in the actual casino but I did get one at the entrance). We loved it. 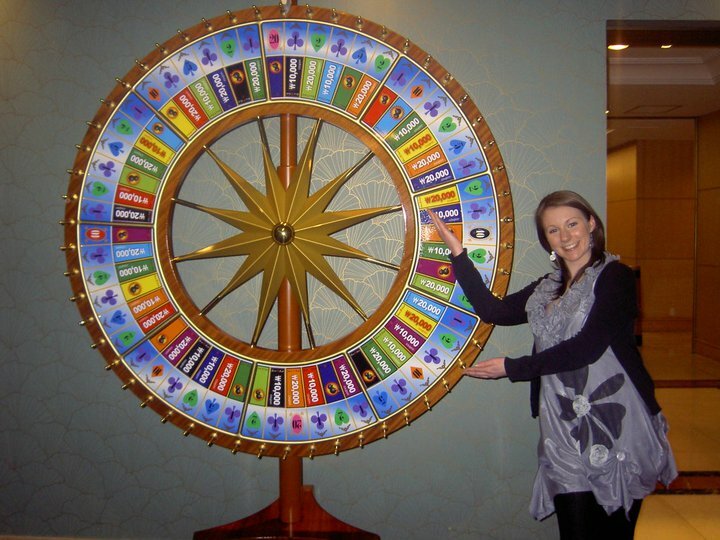 All we had to do was bet a minumum of 2,500 to get a seat and as long as we kept betting they supplied us with free drinks!! 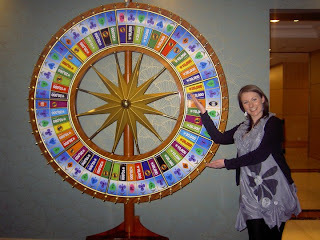 Joanne lost 30,000 won but I made a 5,000 profit. Dee made 40,000 and Kelly made an impressive 80,000. All in all it was a lot of fun and the free cocktails made it all the better! After this we moved areas and joined up with more friends, for more drinks, and more fun. All in all we stayed out a lot later than we thought we would. After that we took a trip to the beach to chill and have a bite to eat before catching the train home. Joanne and I arrived back in the English Village late that night and happily went to bed. Next morning I woke and Joanne gave me all the wonderful cards and presents from home, which made my birthday get off to a wonderful start. I went to work and Joanne joined me later to see my class. 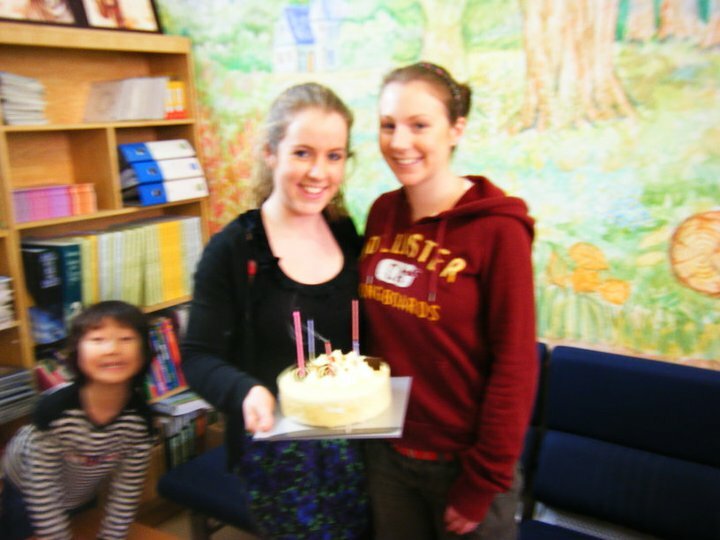 After school the teachers all sang happy birthday to me and we ate cake. Then Joanne and I got the train into Seoul to meet up with Dee, Sam and Kelly and enjoy a night out for my birthday....more wonderful presents!! We drank cocktails and laughed and lot. 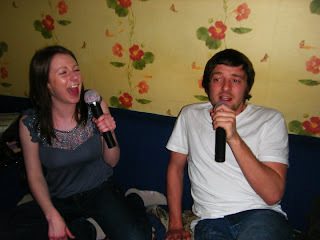 The night ended up by spending 2 hours singing our hearts out in a noraebang (another have to Korean experience). Altogether it was a fantastic birthday which was made a million times better because Joanne was there with me. 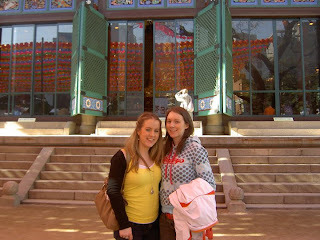 Next day Dee, Kelly, Jo and I did all the tourist things we could in Seoul like visiting the temples and drinking herbal tea in a traditional tea house. 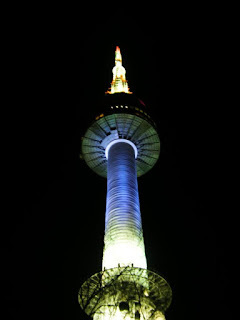 That night Jo and I visited Seoul tower and both of us were amazed at the huge expanse of the lights of Seoul city. Next morning, unfortunately, it was time for Jo to leave but we had a last breakfast together before heading off to the airport. All things went smoothly and before I wanted it was time for Joanne to go through security. I really didn't want to let her go when I hugged her and I'm not ashamed to say we both ended up crying. I know that time will fly until I see her again (and everyone else) but I still missed her the second she was out of view! I wouldn't change those few days for any money!